Men can wear long and embroidered silk kurtas. Sherwani and pathani suits can also give men the desired traditional look. Women can go for bright colours such as pink, rust, red, emerald green, turquoise, golden yellow and orange. Women can get the perfect festive look. Diwali is round the corner and all of us are thinking about diwali celebrations. Here are some office wear ideas for diwali celebrations that can really make some heads turn and your colleagues crooning! Since diwali is a time for fun and prosperity you can play with colour. Go for bright colours such as orange, navy blue, rust or sky blue. If you want a little sophisticated look then you can go for lighter shades of these colours. Avoid dull colours as they are neither in fashion nor do they fit the occasion. If your office keeps a dress code for the day then the decision of office wear becomes quite obvious! Know about healthy diwali gift ideas. For the typical traditional get up you can wear long and embroidered silk kurtas. Sherwani and pathani suits can also give you desires traditional look. If you want to flaunt trendy look then wear silk embroidered shirts. These shirts are available with different embellishments. Get the one that suits your style and pair them with your jeans for a semi-formal look. You can also pair short kurtas with a pair of jeans. Embroidered belts go well with short kurtas, shirts and jeans. It will give traditional festive look to your attire. If you are wearing traditional attire then team up with crush and solid coloured stoles. Depending on your outfit you can choose different footwares. For instance, jootis, mojris and kolhapuris. You can choose to wear closed shoes or sandals for semi formal clothes. Don’t forget to wear a watch to complete your look. On Diwali, we like to dress up in beautiful traditional clothes. Therefore Diwali shopping is great fun for entire family, especially for women. Here are some points that will help you to beautifully dress up for your office Diwali celebrations. Since diwali is symbolic of vibrant colours opt for those colours that reflect joy and excitement. Go for bright colours such as pink, rust, red, emerald green, turquoise, golden yellow and orange. Dress up right this diwali. But make sure that you don’t overdo it while dressing up for office diwali celebrations. 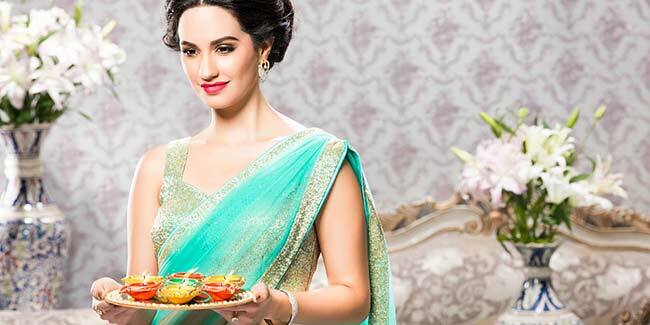 Saree is the Perfect office wear for Diwali. You can opt for kanjeevarams and patolas sarees, especially if there is Diwali pooja at work. At work you can also wear georgette sarees with rajasthani or golden embroidery. Kundan (stone with matte finish) and katha (thread work) sarees are also in vogue. So, get going, girls! Churidar kurtas with delicate silk embroidery give perfect festive look. For a typical traditional look make sure that your kurta is knee length. Foe a trendy look you opt for short kurtas or spaghetti shrugs with delicate embroidery. Pair them with flared skirts for the perfect look. With elegant georgette you can use chandelier earrings or danglers. Authentic traditional jewelry is the best for typical traditional get-up. Embroidered handbags, belts, clutches and potlis are simple add-ons. Mojris (flat footwear), wedge heels, metallic colored heels.